Below are links to our three hotels for the New Mexico Artist Residency. We have negotiated special rates for us all, just reference “Peelwood Group” at your reservation to get the discounted rate. There are room blocks reserved for us at each and different styles and occupancies of rooms are available on a first-come, first-serve basis. 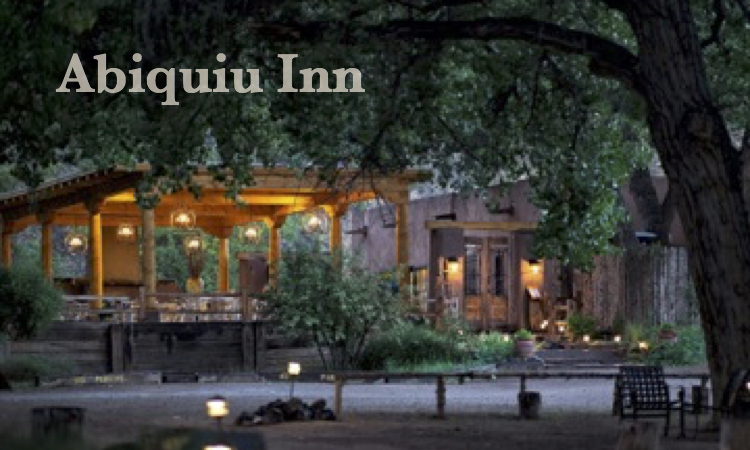 We are staying at the Abiquiu Inn May 26-30th, five nights. checking out on the 31st. Abiquiu Inn houses a lovely restaurant, Cafe Azul, that is open for breakfast, lunch and dinner. There are traditional queen and king rooms available as well as suites and casitas (detached guest cottages) and a two bedroom guest house, so there are many options for doubling up with a friend. To reserve, call (011) 1-505-685-4378. Request the rate for Peelwood group. This will ensure that you are charged the discounted rate.RESERVATIONS CANNOT BE MADE VIA THE HOTEL WEB SITE. We will be staying at Hotel La Fonda on May 31 and June 1st, checking out June 2nd. Hotel La Fonda is located in the center of the historic Taos Plaza, the heart of the original village. A fantastic variety of shops, galleries and restaurants are all around. To reserve, call (011) 1-575-758-2211. Request the rate for Peelwood group. This will ensure that you are charged the discounted rate. RESERVATIONS CANNOT BE MADE VIA THE HOTEL WEB SITE. The Inn of the Governors in Santa Fe is our final stop. We will be staying here on June 2, 3, and 4, checking out on the 5th. Located in the historic district of Old Santa Fe, made the capital of the Spanish Colony in 1607. The Inn has lovely rooms, many with fireplaces and many upgrade options available. There is a full breakfast included every day, a complimentary tea and sherry hour and a year-round heated swimming pool. To reserve, email Deb Swanson, deb@innofthegoverors.com or call (011) 1-505-982-4333. Request the group rate for Peelwood group. This will ensure that you are charged the discounted rate. RESERVATIONS CANNOT BE MADE VIA THE HOTEL WEB SITE.